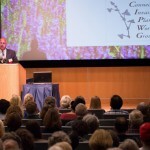 The Connecticut Invasive Plant Working Group (CIPWG) 2016 Invasive Plant Symposium was held on Tuesday, October 11, 2016 at the Student Union, University of Connecticut in Storrs, CT. The theme of the symposium was: Invasive Plants in Our Changing World: Learn from the Past, Prepare for the Future. 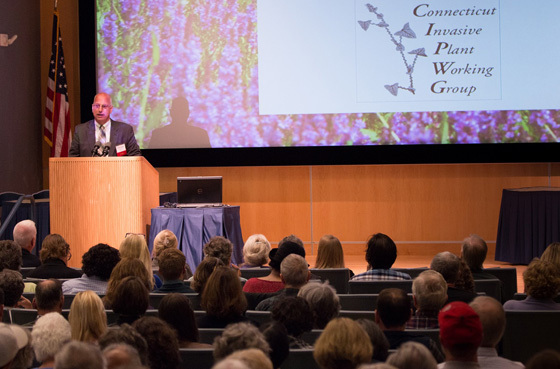 The 8th biennial conference featured national, regional, and local experts as well as citizen volunteers sharing practical solutions for invasive plant management and actions needed to promote native species and improve wildlife habitat. Nationally-recognized Keynote speaker, Jil Swearingen, co-author of Plant Invaders of Mid-Atlantic Natural Areas presented, “We’re Moving on Up: Invasive Plants Heading North”. Karl Wagener, Executive Director of the Connecticut Council on Environmental Quality, spoke on “Connecticut’s Future: Rooted in Choice”. William Hyatt, Vice Chair of the Connecticut Invasive Plants Council, provided a legislative update. Charlotte Pyle, recently retired from the USDA Natural Resources Conservation Service delivered closing remarks. Research and management posters, an invasive plant identification area, and other educational exhibits were featured throughout the day.